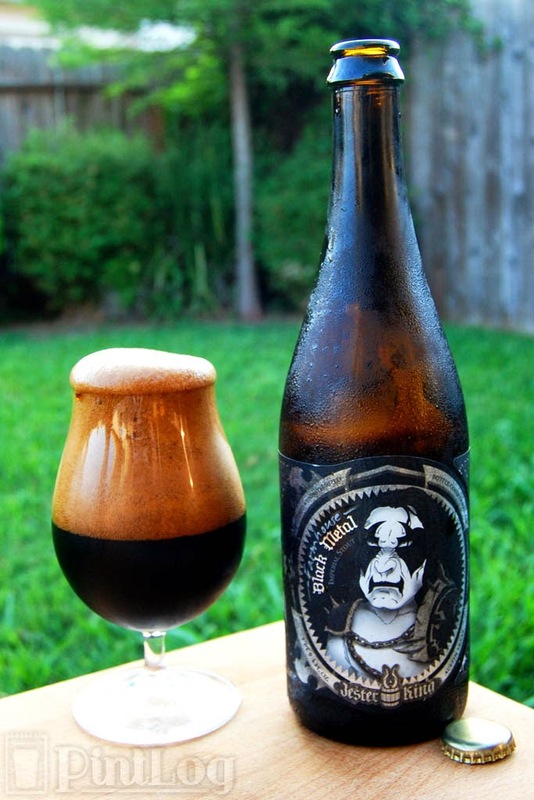 We just took a look back at the original Black Metal, one of Jester King's first releases. After a year or so, the original recipe of Black Metal gave way to this farmhouse version when Jester King switched over to their farmhouse yeast strain as part of their larger plan to develop into a proper authentic farmhouse-style brewery. The same move was made with the other Jester King original lineup beers. While the brand moving to farmhouse style across the board matched with the original vision, I imagine the inherent risks of brewing the old recipes without risking contamination in a brewery filled with the new yeast also contributed to the decision. Some bemoaned the loss of the original beers that established the brand, while others saw it as a necessary step in the larger journey of creating a very special kind of brewery right here in Texas. Looking at what Jester King have transformed themselves into today, the choice seems to have been a rather good one. [A] cruel and punishing beer fermented by the sheer force of its awesome will. Black Metal is dry, roasty, and fermented with farmhouse yeast. I absolutely loved the original formulation of Black Metal, so how will the transition to the farmhouse change things? Let's find out. Appearance: A loud hiss as the cap is cracked (even louder than the old version). Pours a inky pitch black body that lets no light escape. Up top, well over three fingers (even more than the old version; almost a full hand) of fluffy and bubbly tan head featuring brilliant retention (though it burns out a little quicker than the old version) and patchy lacing. Aroma: Dark fruit, leather, peppery spice, vinegar, chocolatey dark malt, and a good amount of booze (especially as it warms). A little more potent (though less boozy) than the version this replaces. Taste: Up front, it's all about the leathery, chocolatey, coffee-like, licorice-like, nutty, earthy, smokey, and astringent malt. Dark fruit and mild citrusy hops fade in a little later, keeping everything balanced. There's a vinegary component running through it (though it's much less apparent than in the nose) that I'm not a fan of here. Bitter hops, roasty malt, leather, and mild booze in the finish. Mouthfeel: Medium bodied and creamy with medium-high carbonation and a drying finish. Nice slickness and burn from the alcohol throughout (though a tad less than the old version). Drinkability: Unsurprisingly still not a speedy beer, this drinks just about as you'd expect given the alcohol content and style. Verdict: Farmhouse Black Metal keeps the homebrewed vibe of the old version alive, but it's not quite as charming here. The vinegary streak running through this just kind of ruins it (compared to the old version) for me. I'm not sure if this is all due to the recipe change, or if something else went wrong here. While this is a solid Imperial Stout, I sure wish it was possible to bring back the old metal!